Happy Friday everyone! Have some free time to stamp this weekend? How about trying Beate’s wsc. Todays sketch is a fun one. I just love circles. This card took longer than expected. I am missing some of my supplies and I point the finger right at my son Ethan. I let him play with punches to keep him involved, but now he wants to explore with more than what I provide & he sneaks around very mischievously to get what he wants. I started this card yesterday morning. I discovered that one of the stamps from the set is missing (just the rubber image…he left the block behind). My Crafters’ Tool Kit is nowhere to be found lol. And lastly, I saved the left over rubber sheet from this die cut set to show customers…..I found it stuck to the wall. So, started in the morning and finished at 2 am because I searched high and low for my items. About the card, I always tend to go crazy when working with flowers. I wanted a cluster to the bottom right circle of the sketch. The sentiment was created with rub-ons. CARDSTOCK: Chocolate Chip, Kiwi Kiss, and Whisper White. 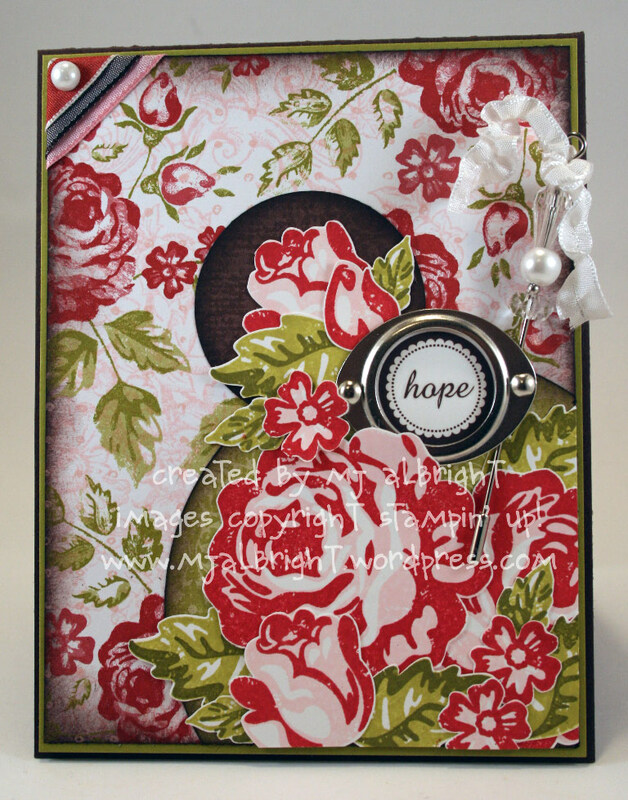 Bella Rose Designer Series Paper. INKS: Chocolate Chip, Riding Hood Red, Pink Pirouette, Kiwi Kiss, and Old Olive. Wow! I LOVE your flower explosion card. It’s beautiful! I also drooled over the new samples posted on the SU site by you and your fellow Artisian Award winners. I love that new feature of the demo site. You know you’re absolutely, right? This is just SO beautiful!! 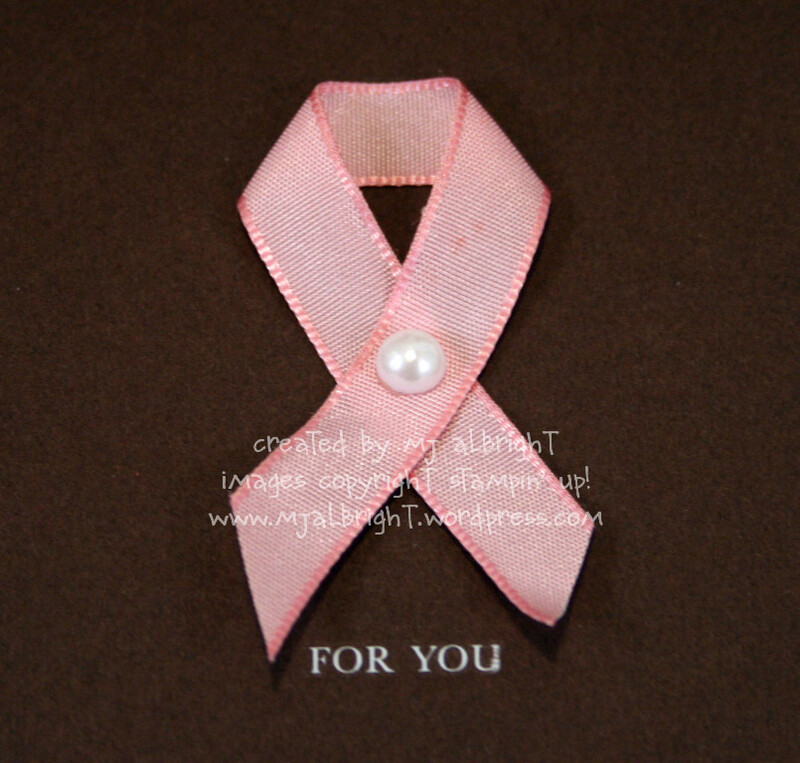 I really love your idea of putting the pink ribbon on the inside! WOW! OMG, This card is just amazing….I LOVE it so much. I LOVE your blog and I get so excited when I check it and you have updated. OH, just gorgeous Mary Jo! WOW! HOpe you find your supplies! LOL Have a great weekend! This is gorgeous! I hope you find your supplies!! And I have the same problems with Kace taking my supplies!!!! Makes me crazy!!!! Are you kidding me? This is absolutely incredible! Mary Jo, you amaze me! Hope those supplies turn up soon! I think your son and my daughter are on the SAME mission. I was also searching for missing supplies late into the night… but my card didn’t turn out NEAR as beautiful as yours. This is BOMB baby!! 🙂 Have a super weekend MJ. Wow! Simply incredible! I always look forward to your posts (I’m a subscriber) and every time, I’m blown away! Wow, I wish I had an ounce of your creativity! My favorite project that you have done so far that I have been a visitor to your blog, is the baby buggy for your coworker. That was just out of the box fantastic! My jaw literally dropped when I scrolled down from the loaf pan to the finished project. But, all of your creations are just awesome. I can’t even come up with a word that really describes your work. It’s absolutely amazing! You rock!!!! Thanks for the inspiration!!!! Just beautiful! I love all of the detail that you put into your projects! Your cards are beautiful as always! I have an award for you over at my blog. Please stop by and have a look! Once again you have created something BEAUTIFUL Mary jo! I love it. Thanks for sharing.. Absolutely gorgeous, MaryJo — love your beaded stick pin accent! My goodnes, it sounds like you are going to have to put a lock on your craft room, LOL! Glad you found enough supplies to make this stunning card! This is so beautiful! The arangment of the roses inside the circles and the pin with the hardware are lovely!